Shipwreck may be regarded as one of the worst things a human being can encounter. The sea is no respecter of persons- instantly, 100s of men can be wiped out. Turner's fascination with man vs. nature is display in The Shipwreck. He wished to portray the power of the elements and how no one is immune from the dangers of an angry sea; he can struggle and fight but ultimately he will be swallowed up by the sea. The unlikelihood of deliverance from such calamity is great. With strong convulsions rends the solid oak. "A brown picture which pervades thro' the water so as to check the idea of it being liquid... The chief light is upon the surge in the foreground-but too much is made to suffer-so that it is artificial-and shows the brown in a more glaring point of view and this inattention of the forms which waves make upon a lee shore embanked." As a landscapist, Turner drew his greatest inspiration from nature itself. He was also inspired by fellow landscape artists, and from a trip he took to the Louvre. Turner's ongoing fascination with the sea, and natural elements, is evidenced by The Shipwreck and his many other marine paintings. The power of the storm and man's subjectivity to such strength was a theme often visited and revisited by the artist. His love for the seaside is said to have begun in 1786 as he attended school in Margate. Throughout his lifetime he visited this English seaside town many times. Turner took his fascination of the sea and put it on canvas. In The Shipwreck his tone, brushstrokes, color palette and lighting all make up a beautiful composition to showcase the inferiority of man vs. the raging elements. Turner fills the canvas with the catastrophes of the sea and the main focus of calamity is towards the center of the canvas. One can feel the movement of the piece as the waves form deadly mountains, the broken ship on a peak, tilting towards the center where the crew awaits their failing destiny. The mood of this piece illustrates the calamity experienced during a shipwreck. Turner chose to exemplify the powers of the great sea compared to man's corruptible and very uncertain existence. One is reminded of true human frailty as they are powerless against the storm's anger. 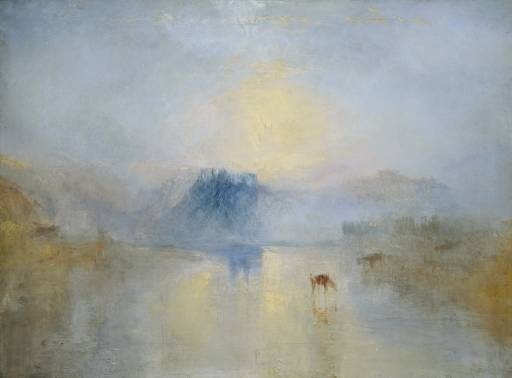 The effectiveness of the lighting in this piece was achieved through Turner's light brush stroke. He has a quick but focused movement, as evidence by the realism of the crashing waves. The blues of the sky and the sea that encompass most of the canvas draw attention to the main action of the piece, the browns that make up the struggling ship. The overall color of this piece is subdued, the brightest element is the struggling, but shining sail. 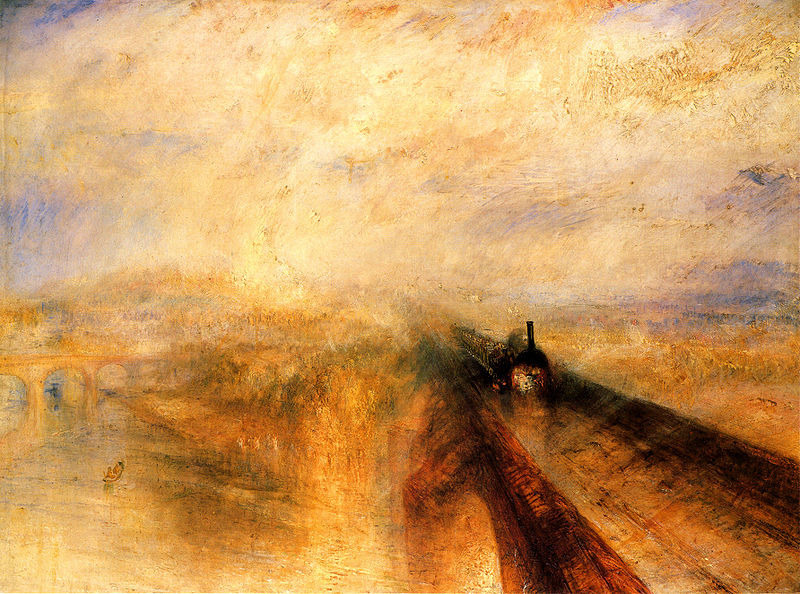 As this painting was completed during his early years, Turner has still laid out the details of the elements in the painting. He pays a great deal of attention to his love of lighting in this piece, though not as heavily as his later paintings. The dark sky partners with the dark and furious sea contrasting against the yellow of the sail. The sail is the only object that draws the attention of light. As the sky is dark and gloomy, one wonders the light source the highlights the sail. Turner was very fortunate when it came to critical reception of his work. The majority of his work was favored by critics, his shipwreck paintings were of no exception. The Shipwreck and other marine life works received much positive feedback from critics. Turner's shipwrecks were admired after his death but did not receive as much attention as his later works, such as the Norham Castle, Sunrise and The Fighting Temeraire. Turner's shipwreck paintings continue to fascinate modern day audiences. Turner visited the subject of marine life many times throughout his career. A few times he chose to depict the perils of marine life through the trauma of shipwreck. Turner's many preparatory sketches are a fascinating study for his actual shipwreck paintings. While The Shipwreck lacks an exact ship to pinpoint, another of his shipwreck paintings is not nameless. 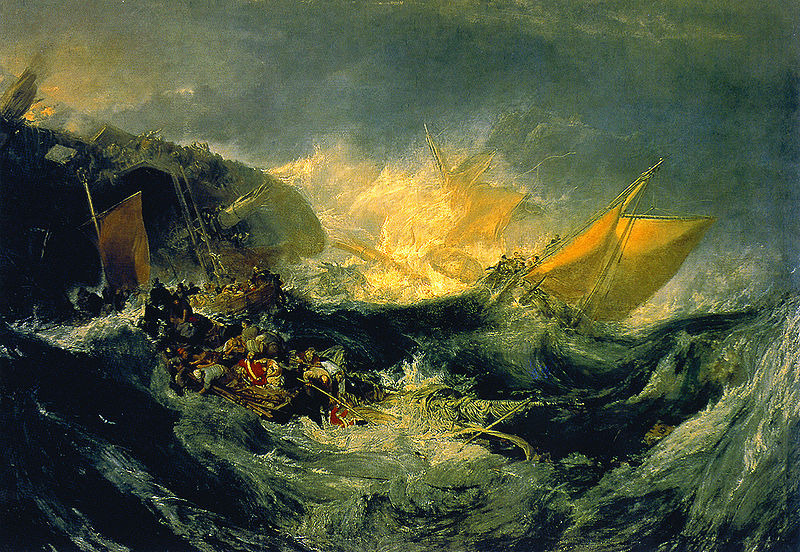 Turner uses a specific event in The Shipwreck of the Minotaur though it was reproduced from sketches from a generic ship. The Minotaur was a ship that had experienced many battles before her shipwreck. On December 22, 1810 the waves of the Haak Bank (Netherlands) caused her to split. 110 member of the crew were fortunate enough to board boats and reach shore. Though they informed Dutch authorities of the disaster, the death toll ranged from 370 - 500 as the Dutch failed to send more rescue vessels. Four lucky survivors made it to shore, apart from the 110, as the clung to the wreckage. Turner submitted The Shipwreck to the Royal Academy in England in 1805 at the age of 30. By this time he had already become a full academician at the Academy, an astonishing achievement at such a young age. The Shipwreck is an early example of his love for the seaside, which began around 1786 while he studied in Margate (a seaside town in England). Throughout his lifetime he visited this English seaside town many times. Shipwreck, a subject familiar to Turner, was a favorite among his critics and were admired after his death but did not receive as much attention as his later works, such as the Norham Castle, Sunrise and The Fighting Temeraire. Romanticism is sometimes viewed as a reaction to its more serious predecessor, the Neoclassical movement. As Neoclassical artists focused on properly accounting history through close attention to detail, Romantic artists flirted with themes of man's self glorification, man's part in nature, divinity found in nature, and emotion. 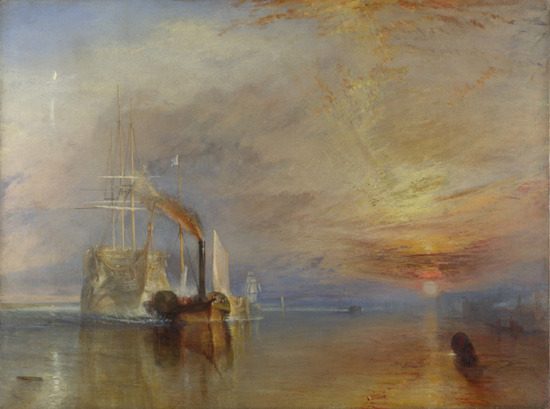 Though Neoclassicism is generally associated with the history genre, Turner is credited with having embarked upon a subject matter so great that it actually rivaled the history genre. His subject matter accounts for recording history, but in a different style than ever seen before. He used color as an intensity of emotion to portray the passing of events. Find out more about Turner and his works.